This Black Cat Family has quickly become my new favorite Halloween decoration. 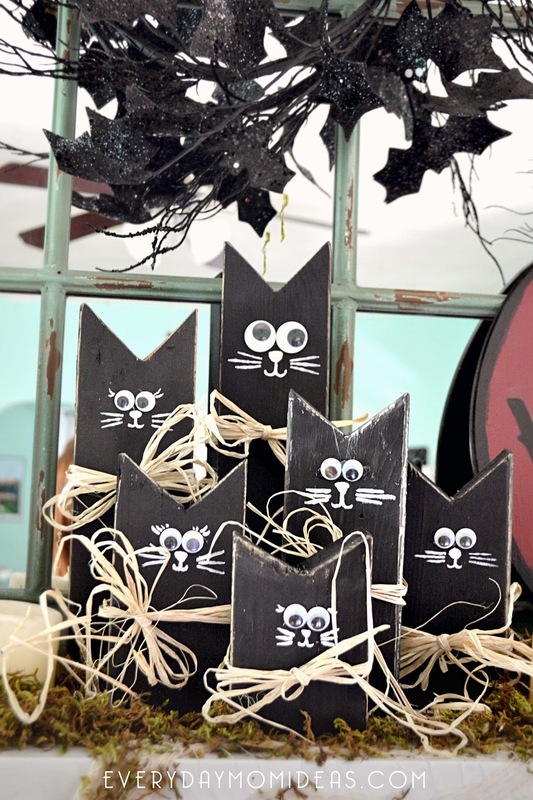 We turned this DIY Halloween craft into a family activity. Each little black cat represents a member of our family and everyone got to make their own... well except the baby. You will notice some of the littlest cats are a little more on the scruffy side. The kids got a bit carried away with the sanding. LOL! 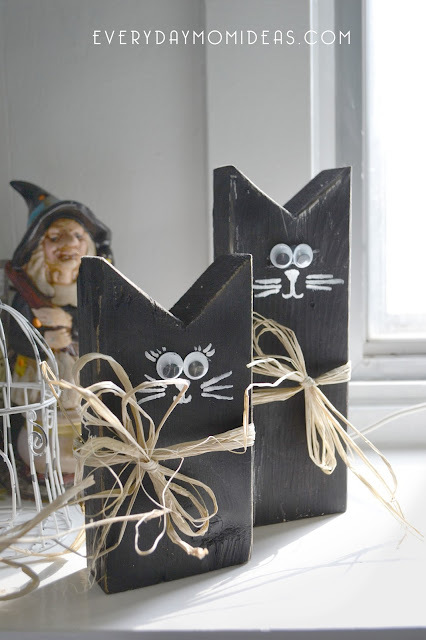 We have tons of left over pieces of 2x4 boards from all of our house renovations and DIY projects so this was the perfect cheap Halloween decoration to add to our collection. 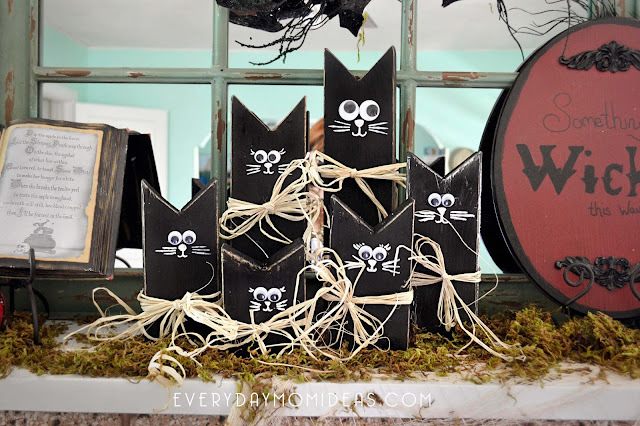 Its cheap, easy and so cute that its spooky! But mostly just cute. 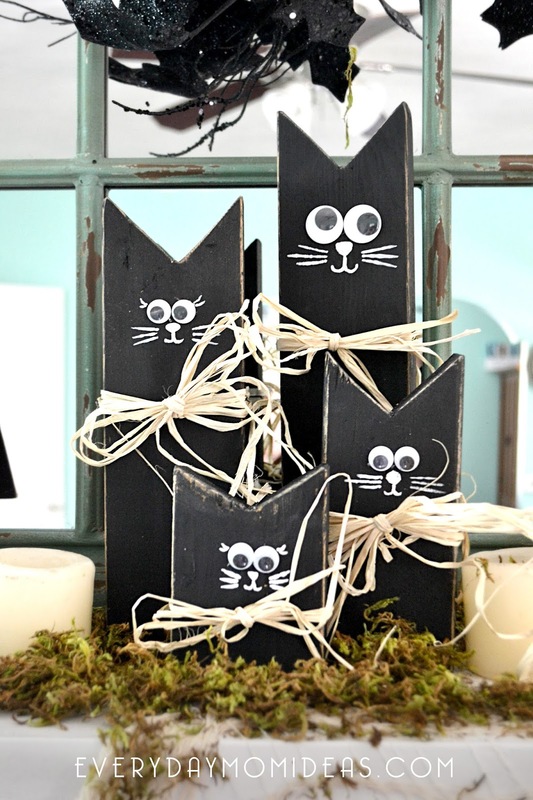 These Black Cat Families look good arranged with just a few of them together or a ton to represent bigger families. Plus it has that personal touch. 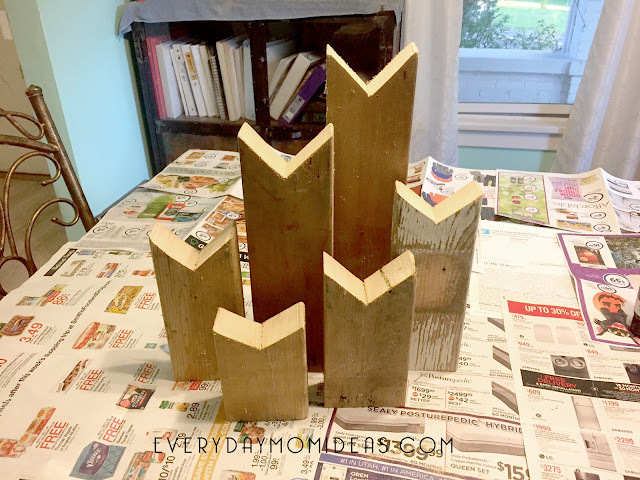 If you have a jig saw, ban saw, or scroll saw, or even a hand saw this is the perfect low key craft. The entire craft cost me just two dollars for all of it. 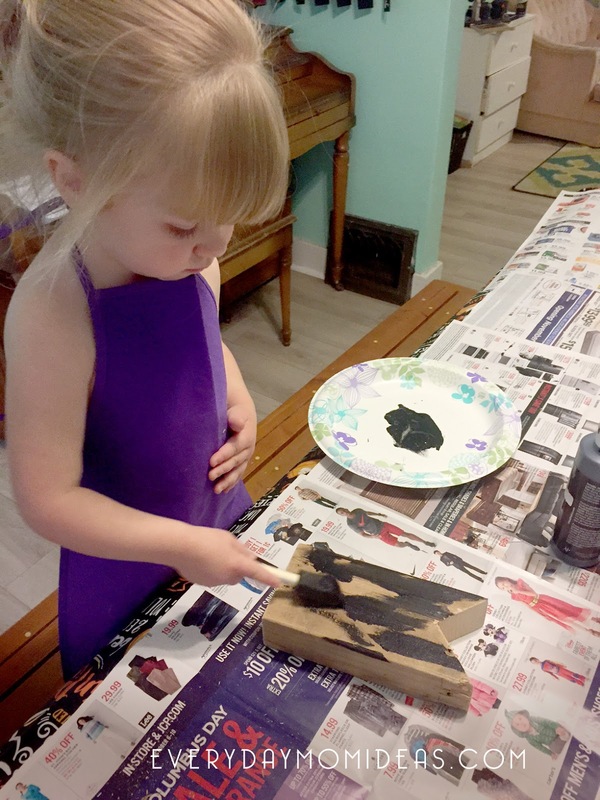 I had the 2x4 wood pieces and the black paint already. All I had to get was the straw ribbons and googly eyes which I found both at our local dollar store. 1. Find or make different lengths of 2x4 wood scraps. 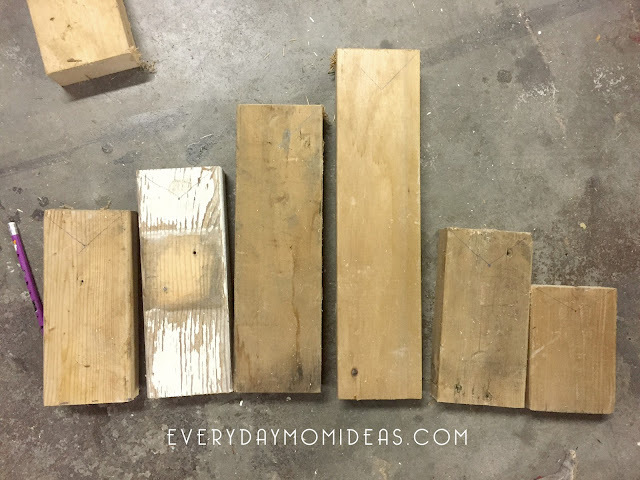 You will want the lengths to represent the different people in your family. 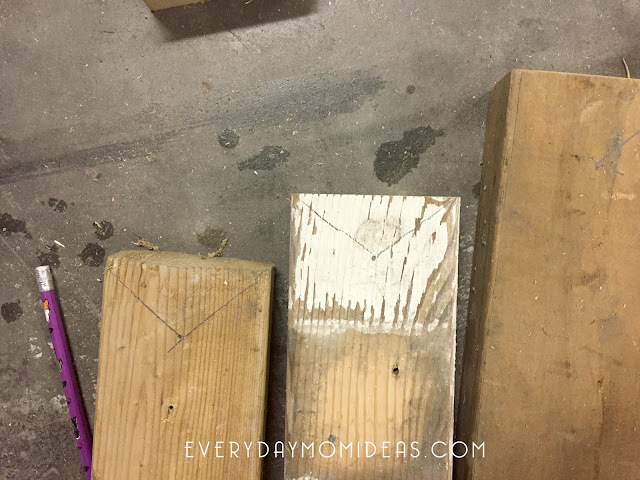 Find the top middle point of your wood and make a dot about an inch and a half down from that. Draw two strait lines. One from each top corner edge to the dot, in order to online your cut for the shape of the ears. 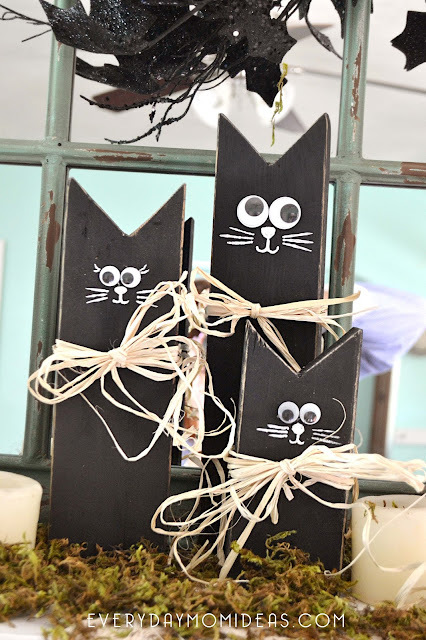 TIP: To give your cat family a little more personality have some cats with one slightly bigger ear than the other, or have some of them having longer pointy ears while others have shorter ears. 2. 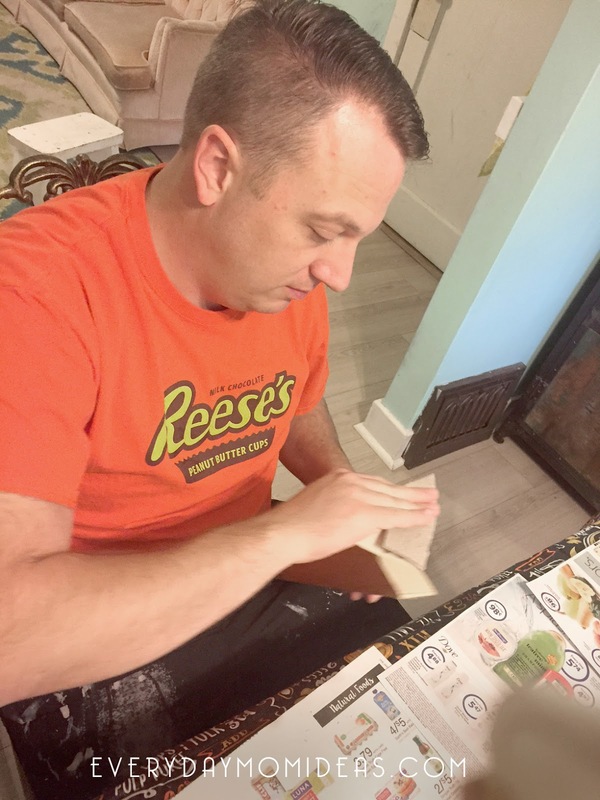 Once all of your pieces are cut to size and the shape of the ears are jig sawed out, its time to sand them smooth and get ready to paint. 3. Paint. Our cats only needed about one really good layer of paint. Craft paint dries pretty quickly but the middle of the ears will take a little longer to dry than the rest. 4. Sanding. Once everything is dry sand the edges and corners. This will help you see the details of the cats better. Sand extra for a more rustic look or less for a cleaner look. 5. Details. Hot glue the googly eye on. A little hot glue goes a long ways with these eyes. Once the googly eyes are on you can finish the look up with painting on the white whiskers and mouth. Be sure to wait till all the paint is dry to put the straw ribbons on. I got a little excited and put mine on too soon and had to repaint the whole face back on. Oooops! TIP: For a little extra wow factor you can always add black glitter over the whole surface of the cat before adding the details. This would be the perfect addition to any glamorous halloween decor. 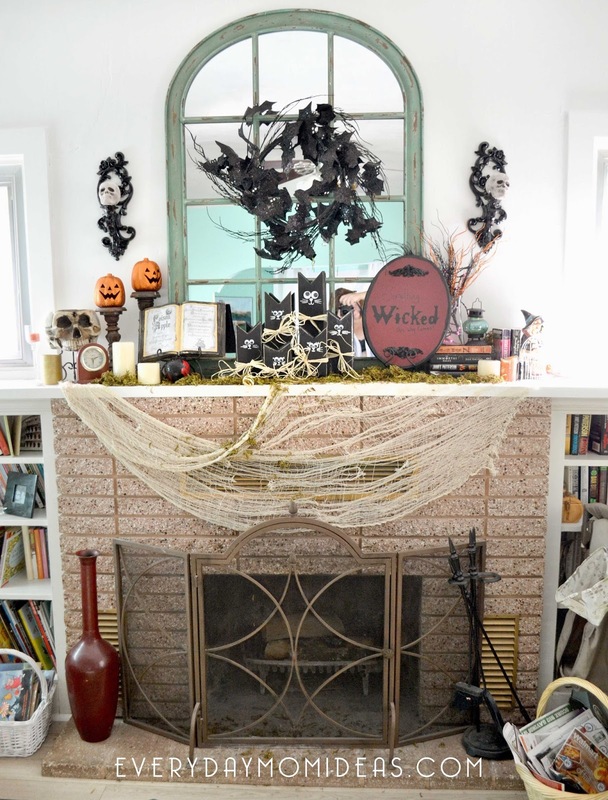 These make the perfect center piece for my Halloween mantle, don't ya think! Hope you found this step by step tutorial helpful. If you have any questions I am happy to help. 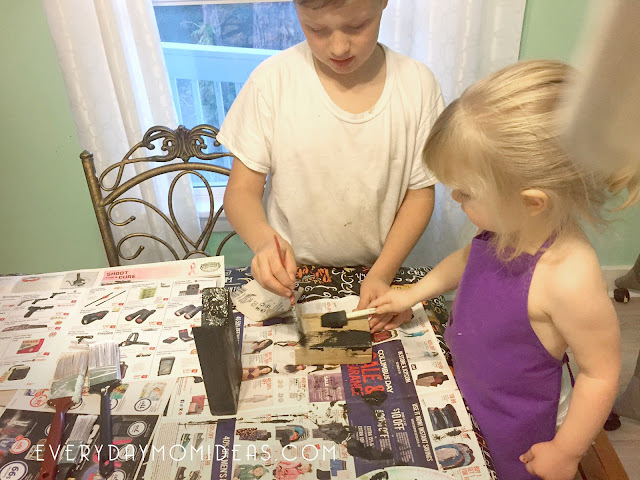 Please share your creations with me on any of your social media accounts and tag me at @everydaymom_julia. I would love to see your creations and share your versions of these crafts with my readers as well. Please share this Pinterest friendly image below with your fiends and family or save this tutorial for you to come back to later. 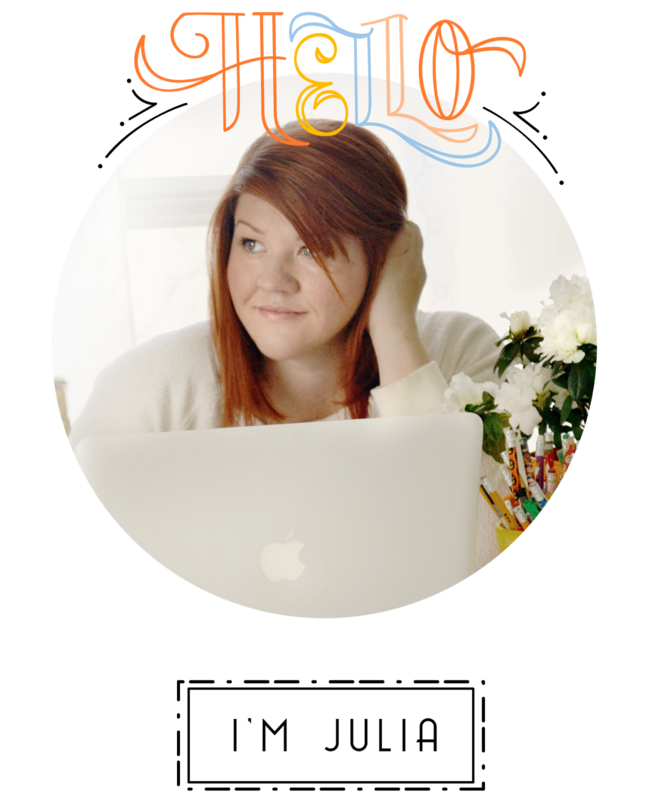 And remember I blog for comments and would love to hear your feedback on this project. Hope you have a very Happy Halloween!